These OSM sceneries are outdated (2014)! Better try and use the new w2xp sceneries. OSM sceneries are only recommended for low-end hardware. Open Street Map (OSM) sceneries are made of open street map data with a tool named osm2xp, which is available for different OS 32/64bit. OSM data is published regularely e.g. at geofabrik.de, where it can be downloaded and processed. Most OSM data is converted into a scenery file. Various settings influence the result. Newest osm sceneries have smart exclusions, i.e. if osm data is available, autogen is excluded – only for these areas. So they can’t penetrate each other. 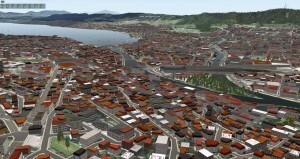 Additionally multi polygons are processed, showing now larger forests and buildings with inner yards. And some improvements where made on objects and facade set. with added autogen (Osm_Europe), that means both osm AND autogen data will be displayed, this needs a high-end computer with VRAM ≥ 3 GB if your setting are extreme. For this version you should also install “Europe_Library”! All other continents have osm and autogen objects separated by smart exclusions.